Finally, It Only Took How Long?! I would like to thank the gentleman that thanked me for talking about agronomy at a conference I presented at recently. Any speaker knows that you’ll be approached after a talk for a myriad of reasons and this one was no different. I was questioned on why I made some of the comments I did, I was let’s say very politely confronted on some things, and I was also thanked for talking about agronomy. You heard me, talking about agronomy. He mentioned that in the six years he has been attending the conference it was the first time that he has heard someone talk about the chemical and physical properties of soil?! Isn’t that what farming, agriculture, growing stuff is? Shouldn’t the very people that are growing our food know about this stuff? I’m not down on conferences. I think it is a symptom of a more significant issue with agriculture as a whole. I hope future discussions across the country continue to work towards educating growers and have more farmer to farmer learning that dives deeper into what is needed. It just shocked me that it took a mid-aged, drives way to fast, colorful language using, opinionated, hair dying, junk food eating, nothing accidental about The Accidental Agronomist from the middle of Pennsylvania to talk about agronomy at a farmer’s conference. Thank you to the guy who thanked me. I’m going to keep on talking about it, agronomy that is. Last week Olivia Newton-John helped me talk about the physical characteristics of a soil. I had to fire her because she wanted a different leotard for each week and it’s just not in the budget. You’re stuck with me talking about the chemical properties or characteristics. 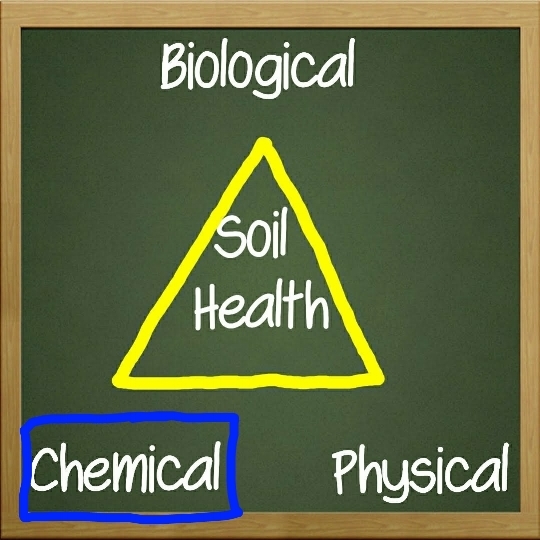 These are inherent properties of soil, making up another aspect of its personality if you will. They are usually indicative of the parent material and any inputs used in your system to amend the soil – not necessarily fertilize, but we’ll go over that in a future post, or call me and we’ll talk. The chemical properties are influenced by the biological and physical properties of soil fertility. Remember the triangle? I think agronomist have a thing for triangles...or at least this one does. Ahh, pH. I wrote a post a long time ago about how you should ask your blueberries about it. Check out a post from a while back I called "Talk to the Blueberries" then come back. What I will say is I think it is often talked about too much and at the same time not given enough attention in the right context by farmers. It is dependent on a myriad of things including time, temperature, microbial activity, soil parent material, irrigation water, fertilizers, and amendments. Irrigation, fertilizers, and amendments are the parts a grower has control. You have to also keep in mind soil will make every attempt to go back to its natural pH. It can't help it; it goes back to getting traits from its parent material. Very similar to us. As much as I want to be a tall blond and I could spend time and money to achieve that, at the end of the day I'm a short brunette. The high heels come off, and the roots grow out. I go back to my inherent characteristics, just like soil wants to. Where things can get away from you is not paying attention to things over time. I worked with a garlic grower that used the same fertilizer for 25-30 years. Over time his pH went from 6.2-8.0. He couldn’t figure out what was going on and why it had gotten out of control. We traced it back to one component in the fertilizer blend he was using. It had a liming effect that isn’t always taken into consideration. I also work with a greenhouse grower that wasn’t consistently monitoring the pH of his irrigation water. Nor was he concerned with the source, due to the fact he failed to mention it until I did a farm visit. It turns out the water source had a high pH and began wreaking havoc in his greenhouse. Simple yet often overlooked things can make or break your entire season and long-term soil fertility. Remember, the soil wasn’t created overnight – problems and their solutions will take time to show as well. Salinity is the amount of soluble salts in the soil. Expressed in a percentage, milligrams per kilogram, parts per million(ppm), or some other convenient ratio. What does it mean to a grower? If not managed and they are allowed to build up over time without any mitigation, you are essentially creating an environment where your plants could start experiencing what is known as a physiologically induced drought. Making it difficult for a plant to absorb and extract water from the soil. I often referred to it a silent killer. You don't know its even happening unless you are being proactive and monitoring your soil and plant health over time. It won't show up immediately, especially if you regularly remove crops and rotate. Here again, I think farmers have heard about the concept. However, what does it mean for your farm? The best way I have heard CEC explained has been to think of it has the pantry for a plant's meals. The dinner plate is the soil solution around the root zone. That is where the readily available nutrients are for the plant to access or eat if you will. The CEC is where the nutrients are that need to be made available to the plant. Often referred to as mineralization, it is carried out by the microbes. They break down the nutrients, essentially bringing to the table, or soil solution, where the plant can utilize them. This is a primitive and probably not the best analogy. However, it gave me a visual representation that made sense. I like to eat and worry about going hungry; our pantry does not get empty too often! Your fertility program should have your soils CEC in mind so that you can manage nutrients efficiently not run out and at the same time not overfill the pantry to excess. Lighter soils, meaning one that has a relatively low CEC and is higher in sand, by nature has a lesser ability to hold cations; conversely heavier soils, one the has a higher CEC and higher clay content, can carry more. I would also like to note, CEC is one piece to the puzzle, low CEC soils can be just as productive if not more so if you are willing to manage based on what you have been giving. Work with your land, not against it, and you can grow crops that are healthy and high yielding. Need I say more...It gets a lot of press. But how does it play a role in your operation? OM is the fraction of the soil that contains the living, dead, and dead stuff. A typical range for most soils is 3%-5%. However, there are those that beg to differ. I always say you put two agronomists in a room and get hundreds of opinions. Put three or more in a room, and we're never coming out. You have to manage OM based on your crops fertility needs, the soils inherent properties, your management practices, and what if any amendments can be justified based on economics or availability. Organic matter is responsible for increasing CEC and helping with pH management. It provides food for the microbial population in the soil as well as helping to maintain healthy aggregate stability. The C:N ratio is the mass of carbon to the mass of nitrogen. For example, if you have a C:N ratio of 20:1, this means that for every 20 molecules of carbon there is one molecule of nitrogen. The C:N ratio is a representation of a soils residue decomposition and also nitrogen. I'll be honest; I have yet to find resources that agree on what a healthy ratio is. A higher C:N ratio means less nitrogen is available, a lower C:N ration indicates more decomposition has taken place essentially tying up nitrogen. The ideal ratio is what will work in your system for your purposes. Ideal management involves using cover crops that will complement each others ratio, to not only increase carbon but encourage nitrogen cycling. Here's a link to an article that includes a chart showing the different C:N ratios for different plants. I've added it because it is an excellent illustration as to how important it is to know how a cover crop will affect your system and what management strategies you will need to consider based on a plants C:N ratio.